There are some who question the veracity of this particular Fish Tale. But I think it too quaint not to retell, regardless. On the East End, Bonackers (short for the Indian word Accabonac, which roughly means land of ground nuts), are the descendants of the earliest working class English settlers of the hamlet known as Springs. Only a few such families remain of what used to be farmers, baymen and fishermen. The Bonacker family names most commonly include Miller, King, Bennett, Conklin, Havens, Strong and Lester. Back in the day, these “bubs” lived low on the food chain. In the toughest of times, particularly during the Great Depression, Bonackers were known to eschew the traditional turkey on Thanksgiving. Instead, they’d stuff a big meaty codfish with scallops, stale bread and whatever veggies their gardens would yield. Perhaps there would be some oyster stew or clam chowder, clam fritters or clam pie as well. The codfish, scallops, oysters and clams were plentiful and cheap, cheap, cheap once upon a time. Not so today. 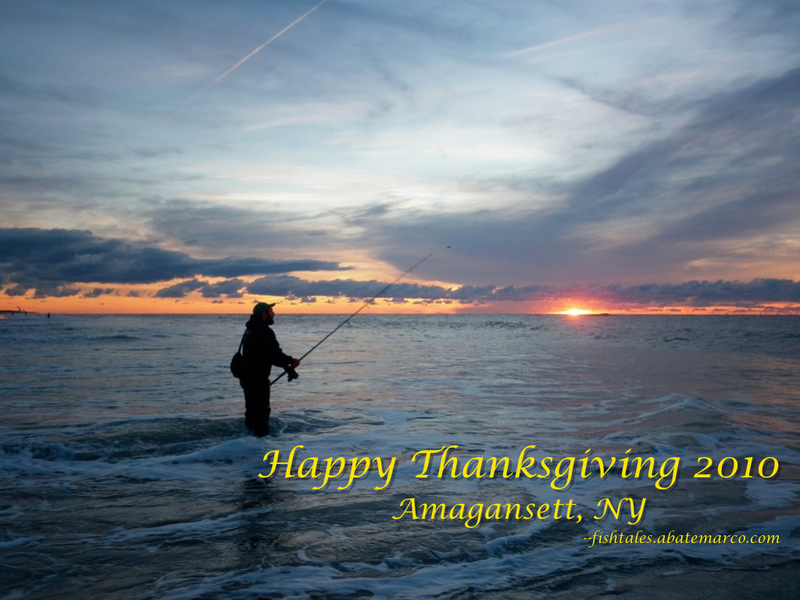 So whether you are fortunate enough to have a fat fowl on your table this holiday, or you are giving a turkey a break by serving a ham, or perhaps a Bonacker’s turkey, here’s wishes for a Happy Thanksgiving from FishTales. This entry was posted on Tuesday, November 23rd, 2010 at 8:37 am and is filed under Uncategorized. You can follow any responses to this entry through the RSS 2.0 feed. You can leave a response, or trackback from your own site. Happy Thanksgiving to you and your family. The Callaway’s will pass on the Bonacker Turkey and instead feast upon the traditional golden brown turkey. I know Phil would enjoy a Bonaker Thanksgiving!! Great story and great pic, thanks. We indulged in the real deal, turkey with stuffing, cranberry sauce, and a variety of casseroles. Love the story but am most impressed with the picture. God lets us know there is much to be grateful for. Happy Thanksgiving week.